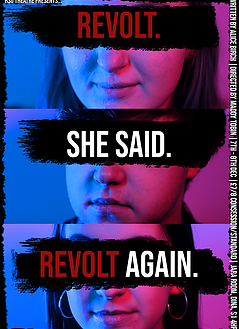 Due to our busy December schedule we are sadly unable to attend HSU Theatre Society’s latest production Revolt. She Said. Revolt Again, but to make up for it I was delighted to interview the show’s director Maddy Tobin to find out more about it and to persuade you to see it. Me: Tell us more about Revolt. She Said. Revolt Again? Maddy: Revolt. She Said. Revolt Again. is a punchy, subversive play that aims to shake up the way we perceive women in different aspects of life, demanding a revolution of language, work, the body, and the world. By playing with language and our expectations of theatre, Birch makes the audience pay attention to her message, and question their own behaviours. Me: What does the role of being director involve and what have you enjoyed most about directing the show? Maddy: From picking the play, to casting and rehearsing, directing has been all about decisions for me. Luckily the play flooded my mind with ideas so I haven’t been short of inspiration, but choosing which elements need drawing out and how to go about it has been a test of my decision making ability! The cast have been brilliant and engaged all the way through the rehearsal process and I couldn’t ask for a more enjoyable group of people to work with (production team included!). Me: For those who haven’t come across HSU Theatre Society before tell us more about the company and how you became involved with it? Maddy: HSU Theatre Society is a student lead group of performers who put on 10 performances a year, including plays, musicals, showcases, and student written theatre. We provide a range of opportunities both on and off stage and encourage our members to try a bit of both. It’s also full of talented and passionate people, many of whom I am lucky to call my friends. Me: What do you consider to be the biggest thing that has shaped women in the 21st century and what do you think needs to be done to improve it? Maddy: I believe that one of the biggest developments to women liberation and civil rights was the invention of the contraceptive pill – by taking birth control into their hands, women were able to shape their futures, careers and choices. Since then, through protest and law making we have seen many improvements to women in the 21st century. Having said that, I feel that women’s lib is nowhere near done! And if we want to see these improvements, feminism must become more intersectional to include trans women, queer women and women of colour. Me: If you could have any radical woman alive or dead in the front row for the performance who would you choose and why? Maddy: This is a tricky question as there are so many radical women! I’d have to Joan Jett for pioneering women in rock music, inventing the Girl punk genre (which was no doubt an influence on this play!) her intersectional charity work, and for being an icon of unapologetic revolutionary womanhood – she doesn’t give a damn about her bad reputation! Me: What’s up next for you and for the company? Maddy: I’m planning to stick to backstage work next semester, but Revolt. is being entered to a drama festival, so there might be more to come! HSU Theatre Society will have more productions next year – a full musical (to be decided!) And our three day theatre festival: Thestival – a mixture of short original writing and variety nights! They are always welcoming students with new plays, musicals and ideas and we do our best to make it happen! Me: And finally, in 10 words why should people see Revolt. She Said. Revolt Again? Maddy: Opens with a woman telling her boyfriend She’ll scissor him…. Revolt. She Said. Revolt Again. will be performed by HSU Theatre Society on Friday 7th and Saturday 8th December at DINA, Sheffield. Tickets are £8 full price and £7 concession. To reserve your tickets visit www.eventbrite.co.uk/e/revolt-she-said-revolt-again-tickets-51521060880. For further information on HSU Theatre Society visit www.hsutheatre.co.uk.